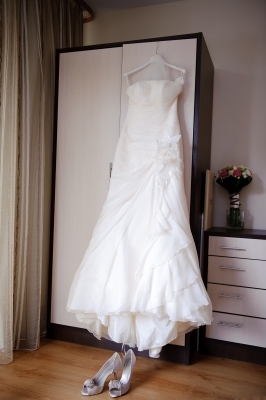 Choosing your ideal wedding dress is one of the most difficult aspects of the wedding day preparations. You want something flattering, of course. You want the dress to reflect your own personal style and to be something you will be proud to wear. And you need the dress to be within your budget. Brides-to-be in Oxfordshire may have plenty of options in terms of shops and wedding dress outlets, but it still remains difficult to find the right dress. Take a look at these tips for choosing a wedding dress to suit your individual shape and style. Choose a dress that hangs loosely from the waist in an A-formation, skimming past the hips while emphasising your narrow waist. If you can find a dress with a skirt in a sturdy fabric this is better, as it will not cling to your curves. Show-off your slimmer upper body with spaghetti straps or a v-shaped neckline. Empire-line dresses with the skirt that goes from right under the bust to the floor in an A-line shape are flattering and stylish. Avoid pleating, and make sure that the dress is not too loose but is more fitted to your shape. If you like the look of floaty, lacy fabrics then use these over the top of a thicker fabric that will not cling. Opt for a wedding dress that goes in at the smallest point on the waist with a flare into an A-shape. You should look for bodices that have plenty of texture with pleats, ruches, or lace. Pick a deep V neckline that will elongate the body. Look for a dress with a scooped neckline that will give you a beautiful décolletage without showing off too much. If you are wearing a strapless gown then choose one with a sweetheart neckline or a tiny dip in the middle, rather than a strapless that goes in a straight line. Choose a simple silhouette that won’t make you look overpowering. Emphasise the natural long proportions of your body with a lower waistline, low hem, and long sleeves past the wrist. The dress should fit well, and not look like it is meant for a shorter person with cut-off hems and sleeves. Consider simple accompaniments and don’t try for too many embellishments. When you are picking your dress, also think about the style of wedding you want and how the dress fits with that design. There are so many different wedding venues in Oxfordshire providing different types of wedding day – make sure that your dress and the overall theme of the wedding match. If you are looking for a dress that may not necessarily be a bridal dress, but you want something designer and special, head to Bicester Village. This outlet store sells past-season designer clothes at big discounts. By browsing some of the stores and following the advice above, you could find a one-of-a-kind dress at a lower price.